JeeMon is a portable runtime for Physical Computing and Home Automation. The standard library for this runtime is provided by the JeeRev project. For x86-based Windows, Mac OSX, and Linux platforms there’s no need to build anything: there are ready-to-use runtimes at http://dl.jeelabs.org/jeemon/. Just download the archive, unzip it, and launch JeeMon to start things going. Note: the 64-bit builds have had less testing than the 32-bit ones so far. For an explanation of the ideas behind this approach, see the INSTALL doc. If you’d rather do everything yourself and see the code that drives it, read on. 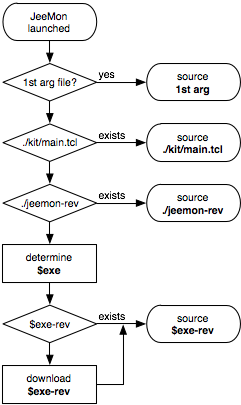 JeeMon is nothing more than a slightly extended version of Tclkit. Then type make to build JeeMon for all platforms in the exes directory. The result is a set of ZIP archives in the zips directory. When done, type make clean to remove the builds. Each ZIP file is for a specific platform. Once unpacked, the jeemon runtime (jeemon.exe on Windows) can be launched as is with no further installation. For convenience, you can move the runtime to a directory on the exe search PATH. With an existing file as first argument, JeeMon behaves the same as tclkit and tclsh (the Tcl command shell) and runs the script. Otherwise, JeeMon will look for a kit/main.tcl or jeemon-rev file to launch. If not found, the rev file is downloaded from a fixed HTTP web address. Note: the name of the rev file depends on the name of the executable, i.e. if jeemon is renamed to FooBar, then the rev file name will be foobar-rev.